Looking to move up the ladder? Position your mouses accordingly. 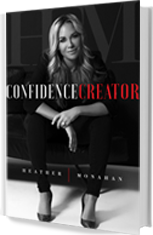 Career coach, motivational speaker and media executive Heather Monahan will be launching her namesake website next month. The Chicago-born SoBe resident is targeting the site to women to empower them in their careers and life beyond the office. We spoke to the local powerhouse, chief revenue officer at Beasley Broadcast Group. I grew up very poor and had to overcome a lot of personal challenges and insecurities. I luckily found sports as an outlet very early on. Sports allowed me the chance to feel good about myself and find ways to experience wins in life when life didn’t seem like a lot of fun. I learned how to take responsibility for myself while understanding that there was a bigger picture. You never have to do a deal because there is always another one down the road. When you don’t feel desperate to make something work, you can step away from a situation and see that there is so much else out there. Do you have a quote that inspires you? “Have the courage to follow your heart and intuition. They somehow know what you truly want to become.” — Steve Jobs. Which famous females have it together? The reality is famous women are no different than you or me, but they have trainers, chefs, PR people, media people, hair and makeup people and have crafted an image that they are presenting. It is entirely strategic and purposeful. OK, girl talk: What’s something you can’t leave home without? Lip gloss and sunglasses! I mean: This is Miami, they are must-haves. How does the professional woman here differ from other parts of the U.S.? They rock confidence and style like no one else. I always tell people it is worth a work trip to another city so you can land and be a 10 for a short while. Miami has the most beautiful and diverse women in the country, and it forces you to up your game.